Why hello there! You've already seen pictures from our stay at the Swissotel Sydney - but what about the food?! If you've been reading Southern In-Law for a while, you'd already know that on top of coeliac disease - I'm also the queen of food intolerances. This means that eating out is incredibly hard and I generally didn't eat out at restaurants at all (instead eating before/after or taking my own food) to save myself from getting seriously ill. 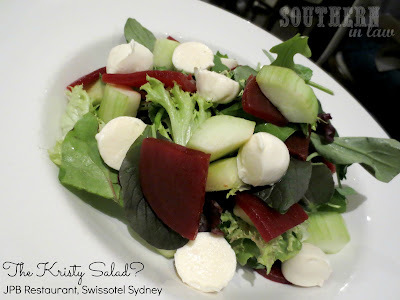 The Swissotel Sydney thought they could handle my allergies and intolerances - and as I get so many emails and questions from you all for allergy friendly options, I thought I'd be the guinea pig and suss things out for you. We had reservations at the JPB Restaurant in the hotel at 6pm, so after our lazy afternoon, Jesse and I headed downstairs for dinner. As we sat down at our cozy corner table, our drink orders were taken and some fresh housemade bread arrived at the table. House baked spelt bread for Jesse and warm house baked gluten free bread for me! 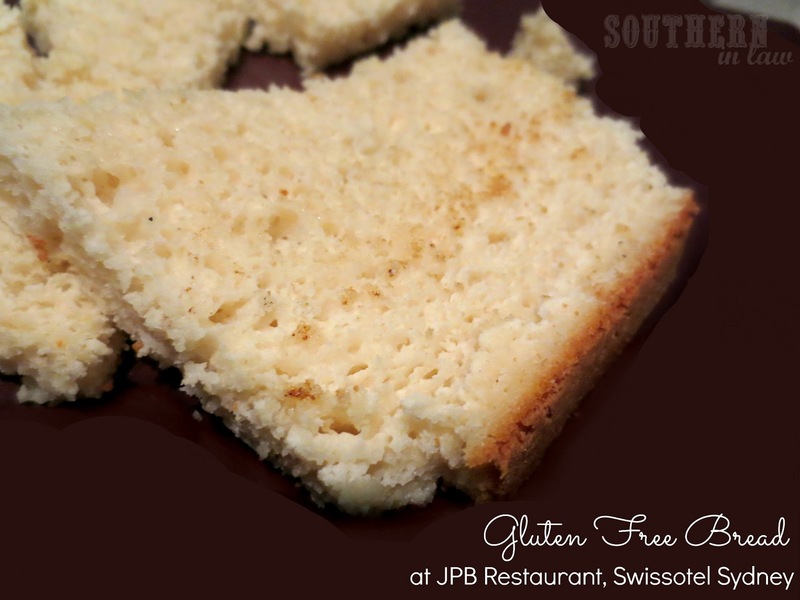 Jesse said the spelt bread was delicious and I thought the gluten free bread was delicious too - with soft innards and a crunchy crust. In fact, I said to Jesse "oh this tastes too good... like that good that you start worrying where the gluten is hidden" - but Jesse tasted it and assured me it was definitely gluten free (this is what happens when you haven't eaten real bread for a while). Their menu is great, with seasonal dishes and the produce brought straight from the farmers to the hotel. All of the produce is also organic and the all of the dishes put alot of emphasis on the produce, rather than fussy sauces or fancy cover ups. 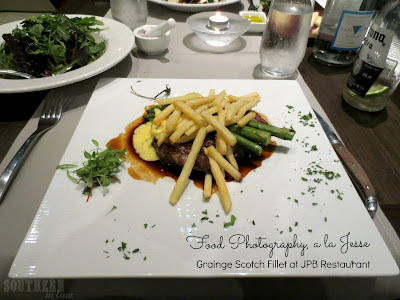 Jesse ordered the Grainge Scotch Fillet with asparagus, potato chips and a bernaise sauce (minus the beetroot because he's not a fan) as he's a steak man and can eat anything he likes (unlike his fussy-stomached wife to be) along with a garden salad on the side. Fusspot-stomached Kristy, on the other hand, had to do some adapting. I don't eat meat (for taste and digestion reasons) and I can't eat soy, and the only gluten free vegetarian option on the menu was the polenta coated tofu which clearly I can't eat. I decided on ordering some side dishes and hoping they could change a few things up for me. I let the staff know that in addition to my coeliac disease (which I had let them know in advance - something any coeliac should do at any restaurant) I also had a number of other intolerances, including tomatoes, dishes with alot of oil/butter, spicy foods, acidic foods etc (don't worry, I didn't explain things that vaguely). As a broccolini fan, the steamed broccolini with toasted almonds was a no brainer, however, as soon as I put the first piece in my mouth I noticed something..... the steamed broccolini was coated in butter? I quickly asked the waitress and she apologised and told me she'd get another dish made without butter. I also ordered the side salad, though completely switched it up so that it was more substantial (girl can't just eat lettuce!). I added bocconcini, beetroot and cucumber as they were items I could eat and were already on the menu. First off the salad came out with tomatoes, which the waiter quickly noticed when he walked past and sent it back to the kitchen to be made again. Insert Kristy feeling absolutely terrible and super embarassed as I hate having to make people go out of their way for me! Soon the new dishes were arriving at our table, brought out by the chef who assured me that everything had been fixed up and completely new dishes had been made. He noticed there was one tomato on the plate with the broccolini and offered to make another new dish, however, I told him it was fine and pushed it aside. 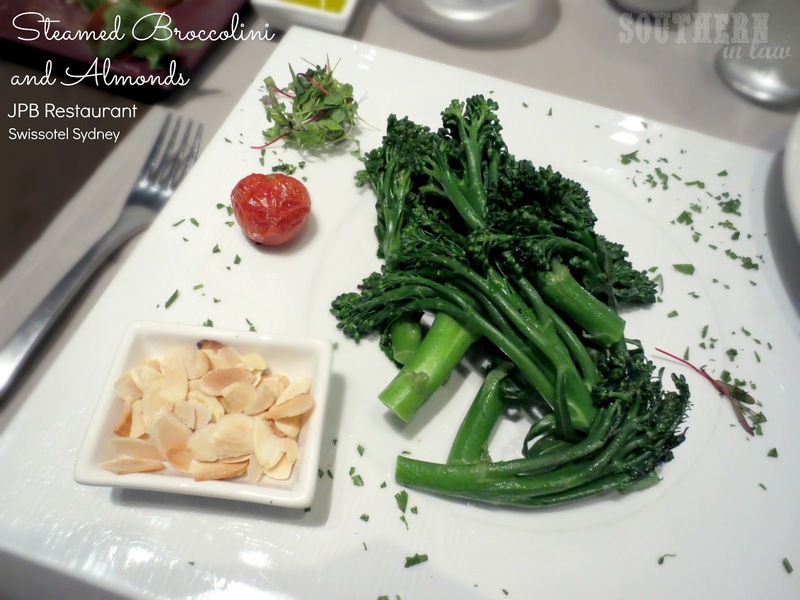 The broccolini was delicious and the toasted almonds went perfectly with it - but the salad was so so. But it was the best I could do and I was appreciative that they tried their best to accomodate for me - I'm just a little bit spoilt by my amazing salad making skills I suppose ;) I don't know about you, but I hate pickled beets even though I absolutely adore fresh and roasted beetroot so I was sad to see pickled beets in the salad and ended up pushing them to the side. The view from the restaurant was absolutely gorgeous, with big open windows looking out onto the city lights and the seating was incredibly comfortable - with booth seating with cushions around the outside of the dining area and regular seating in the middle. The only thing not so good was that the seating was quite squishy and close together. I'm not a big girl, so that didn't bother me, however, I heard a few comments from a table near us about the table being too close and I am sure that would make some people feel uncomfortable. Suprisingly, the restaurant was quite quiet - with you only able to hear the conversations of those who were closest to you - and not the whole restaurant's noise like you sometimes find in restaurants without soft furnishings. 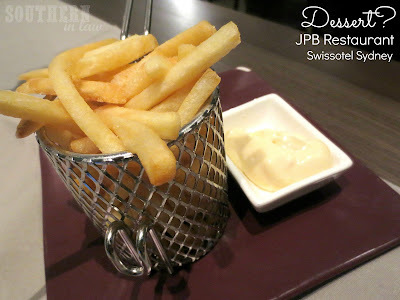 Knowing that sugar would go straight to my head, having eaten mainly vegetables, I gave dessert a miss - however, Jesse decided on an alternative dessert... a serve of fries. The little basket the fries came out with was super cute and Jesse was in heaven (when we're out for dinner, I don't care what he eats as we don't eat fried food at home). 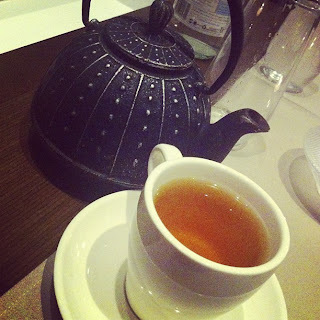 I settled with a pot of peppermint tea which was delicious and the perfect ending for a cool night. 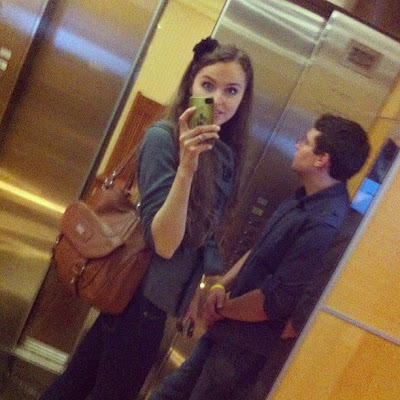 Then we headed back up to our room (as Jesse told me it was too chilly to walk in the city) and relaxed before bed. Now... I know someone is going to say Kristy, that wasn't enough for dinner! 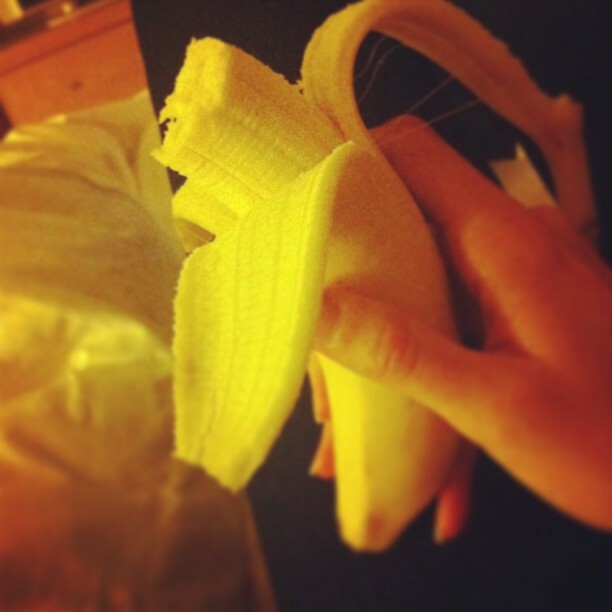 and I agree, so I can promise you - bananas and peanut butter were devoured once we were in our room. When travelling with intolerances or allergies, you always need to be prepared. In this case, it was BYOB (bring your own banana) but I always make sure I have added extras in my purse or suitcase just in case. Needless to say, Sydney Swissotel's JPB Restaurant is a great choice with a stunning view (just make sure you politely ask to sit at an edge table!) and the staff are incredibly friendly and accomodating. AND I didn't end up sick at the end of the night, so it's a coeliac win! Want More? 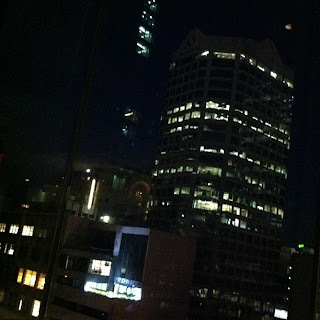 See: Our Stay at the Swissotel Sydney - Brunch at DARE, The Rocks. So tell me, have you ever sent food back at a restaurant? and if you have allergies/intolerances, what's your tips for dining out? 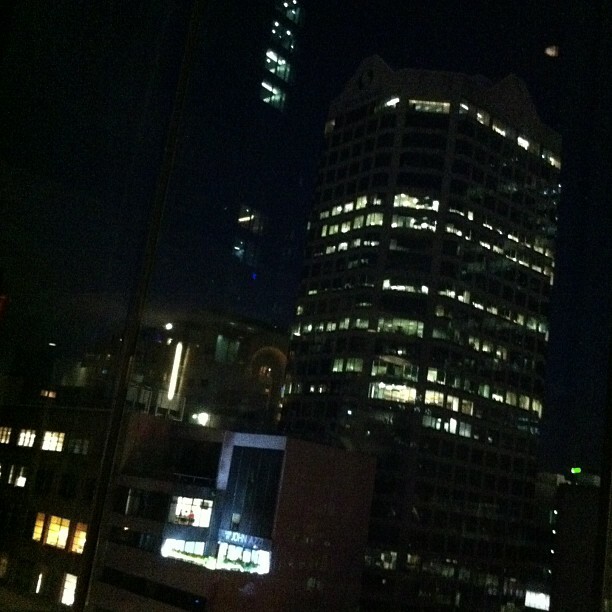 Kristy and Jesse stayed as Guests of the Swissotel Sydney. No compensation was received for this review and all opinions expressed are their own. Only a complimentary one night stay and dinner at JPB was provided. I would be scared to have you over for dinner, but from what I've seen/read, I'm definitely coming to yours for dinner :) x (totally not joking!). Haha, so many people say that to me! It's really not that scary finding food for me, but then again - I do it daily so I'm used to it.